Description: Press release announcing that Marigold Goetz of LaGrange, a student at the University of Illinois at Chicago, has been named recipient of the Governors Medallion of Excellence for her oil painting, Princess and the Peacock, in the 2006 Annual Collegiate Artists Competition. 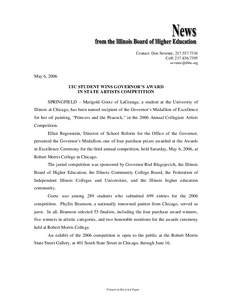 Uldrych v. VHS of Illinois, Inc. Description: JUSTICE KARMEIER delivered the judgment of the court, with opinion. Chief Justice Kilbride and Justices Freeman, Thomas, Garman, and Burke concurred in the judgment and opinion. Justice Theis took no part in the decision. The parties involved in this appeal were all named as defendants in a medical malpractice action. In February of 2003, a man had gastric bypass surgery at MacNeal Hospital. 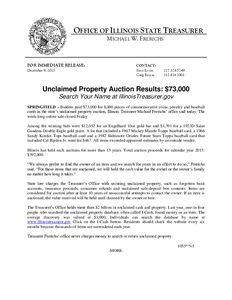 Description: Illinois Supreme Court Opinion in the case of Sharee Ultsch, Appellant, v. The Illinois Municipal Retirement Fund, Appellee. 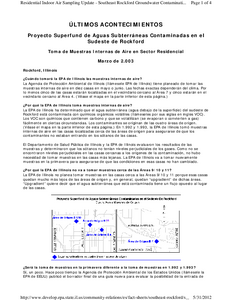 Description: Press release: El director del Departamento de Salud Pblica de Illinois confirm hoy un caso de sarampin en Illinois. Un residente de los suburbios del condado de Cook se enferm a mediados de enero y los resultados positivos de sarampin regresaron este fin de semana. 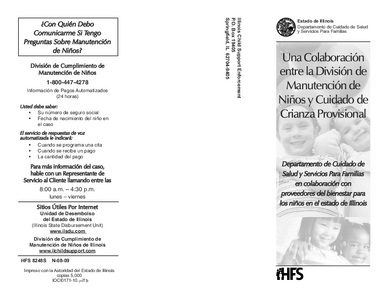 Description: Brochure concerning child support issues. Mantener a sus nios econmicamente es una responsabilidad de la crianza de los hijos. As que, si su nio es temporalmente colocado fuera de su hogar o todava est bajo su cuidado, usted sigue siendo responsable de su bienestar econmico. 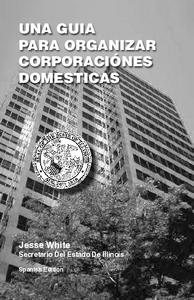 Description: provee este folleto para ayudarle a comprender el proceso de registrarse como una corporacin extranjera calificado para negociar en Illinois. Tambin explica lo que usted debe hacer para conservar su corporacin en buen estado con la Oficina de la Secretara del Estado. Description: Mi oficina proporciona este folleto para ayudar en el proceso de crear su propia corporacin, un procedimiento que a veces puede ser muy complicado. Nuestro propocito es asistirle en archivar los Artculos de Incorporacin. Tambin se incluyen las decisiones que usted debe tomar, las agencias de gobierno que usted debe avisar, y las obligaciones legales que usted asumir despus de incorporar. Description: Los negocios se pueden organizar en muchas maneras. 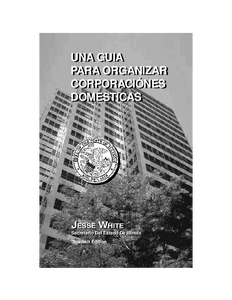 Las formas mas comunes de Organizacines de Negocios son proprietario unico, asociaciones, asociaciones limitadas y corporacines. Esta guia asume que usted ha escogido corporacin como la forma mas adequada para sus objetivos. Description: Provee este folleto para ayudarle en el proceso de formar su corporacin sin fines lucrativos, un procedimiento que algunas veces puede ser muy complicado. Description: Illinois State Water Survey simple bounding estimates suggest that the practical sustained yield of this aquifer in northeastern Illinois could range from 28 mgd million gallons per day to 180 mgd as a consequence of parameter and conceptual uncertainties. The analysis also suggests revising the current approach to estimating groundwater availability. Description: Bidders paid $73,000 for 8,000 pieces of commemorative coins, jewelry and baseball cards in the states unclaimed property auction, Illinois Treasurer Michael Frerichs office said today. The week-long online sale closed Friday. 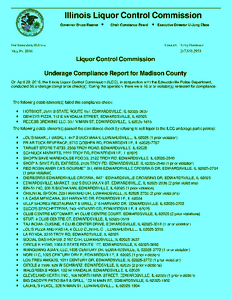 Description: Press Release: On April 28, 2016, the Illinois Liquor Control Commission (ILCC), in conjunction with the Edwardsville Police Department, conducted 36 underage compliance check(s). During the operation, there were 16 prior violator(s) re-tested for compliance. Description: The 2016 Underrepresented Groups Report presents information on postsecondary students traditionally identified as underrepresented groups (URG) in Illinois public universities. It seeks to track recent changes in representation among these groups and highlight efforts to improve participation of minorities and individuals with disabilities. The Illinois public universities have provided data and explanations of the strategies, methods and ongoing plans to increase participation. 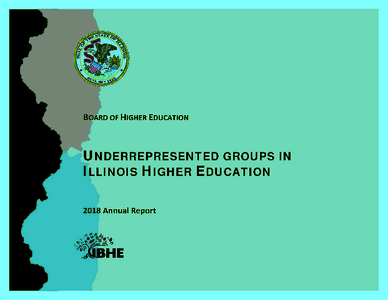 Description: Illinois Board of Higher Education 2018 annual report. 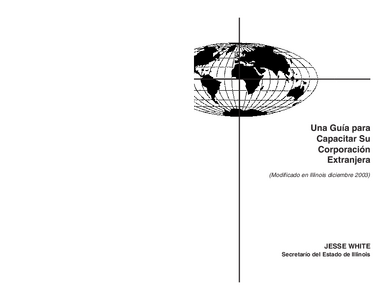 Description: A Resource Paper Prepared for the Illinois Board of Higher Education to support a greater understanding of collaboration through a description of its distinguishing characteristics; an examination of collaboration as a continuum; consideration of Professional Development Schools as the penultimate model of P-20 collaboration; a review of issues associated with the success of collaborative efforts; and perspectives on the development of collaboration. As appropriate, these discussions are linked to collaboration within the P-20 environment and to the BHE Title II grant requirements. 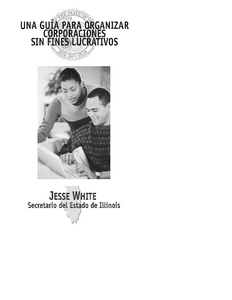 Description: Press Release: The Illinois Department of Insurance today highlighted new federal legislation that will provide critical assistance to laid-off Illinois workers and their families.